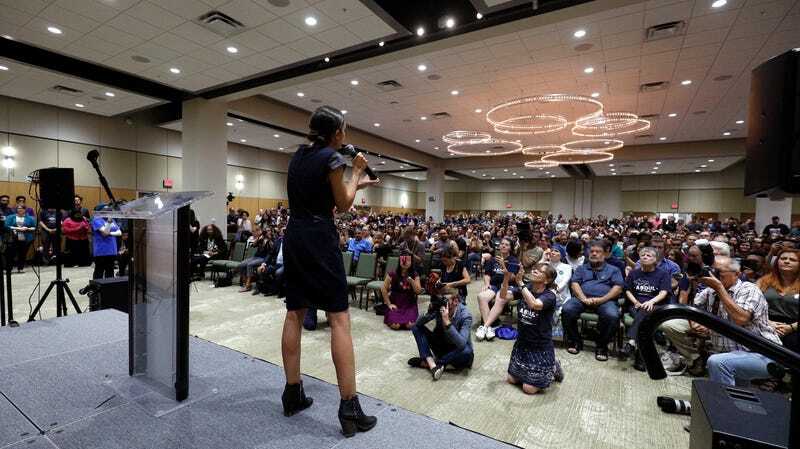 Alexandria Ocasio-Cortez has been barnstorming America just like she promised she would, both getting butts in seats and lighting a fire under the Democratic party’s. She went to Kansas with Bernie Sanders a few weeks ago (making for this delightful photo-op); then Missouri to campaign for once-homeless activist and her friend Cori Bush for Congress, resulting in a massive boost in campaign contributions; and now she’s teaming up with Sanders again in Michigan for 33-year old physician Abdul El-Sayed, who would be America’s first Muslim governor. El-Sayed, like Ocasio-Cortez, is pitted as an underdog progressive up against the party establishment which largely supports his rival Gretchen Whitmer. With the endorsement of Bernie Sanders last week, he’s reportedly shot up to second place from 12 to 27 percent, creeping up on Whitmer’s 33 percent and raising hopes of another upset victory. And like Sanders and Ocasio-Cortez, El-Sayed–former executive director of the Detroit Health Department–supports single-payer healthcare and has drawn up a plan which would be paid for by higher taxes on large businesses. He’s criticized Whitmer for accepting money from Blue Cross Blue Shield. (The Washington Post reports that the company’s employees have given her a total of $120,000 this year. Whitmer has shot back that El-Sayed has also accepted donations from “corporate” executives, though the Post points out that they were mainly executives of small companies and nonprofits.) Whitmer calls his single-payer plan “unrealistic” and proposes expanding Medicaid as she did, working across the aisle to negotiate a plan during her 14 years in the state senate. As executive director of the Detroit Health Department for two years, El-Sayed founded a program which provides free glasses for Detroit children, ensured that schools’ water was screened for lead (Flint is often invoked), and currently promises stricter regulations on water quality. He supports renewable energy, $15 minimum wage, four-year state-sponsored college scholarships, and free, publicly-owned internet. The outcome is anyone’s guess in Michigan, a state which first voted for Sanders in the Democratic primaries and then Trump in the presidential election. Although Ocasio-Cortez is proof that anything could happen if you push the very limits of human exertion. She’s in LA now, but she’s skipping Hollywood. The primaries in Kansas, Missouri, and Michigan will take place on Tuesday, August 7th.